For our April edition, we’re bringing special guest- DJ Kyle to SUTS! Music policy for the month – heavy on the old-school salsa (clasica, dura, guaguanco) and a hint of salsa moderno/ funk, but still expect some Cha Cha, Bachata, Reggaeton and Kizomba. DJ Kyle will be supported by resident DJ May May on the decks. There’ll be the usual 60-minute Salsa LA-style workshop from 7:15 pm (instructor TBC). Fee is $5 at the door, no prior registration needed. Free-entry (after the workshop) and fuss-free! Happy Hour all night! All levels, ages and styles welcome. No partner required. No politics, no drama – just fun! Amazing vegetarian street food by Banyan Tamarind food. Think falafels, soursop tacos and other treats! 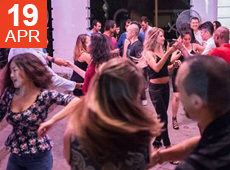 Salsa Under The Stars is a monthly indoor/outdoor Latin dance and musical experience at SG’s hottest arts and entertainment venue – Kult Kafe on enchanting Emily Hill. No stranger to the Singapore salsa scene and a great dancer himself, Kyle has played for numerous Latin dance events including Bailamos XI social, Old School Salsa party, Afro Latin Fever, Alegria Dance Company social party, The Studio Furry Dance Weekend charity social, Baila Loco Feb 2017, JJ SalsaRengue 15th Anniversary Party, and JJ SalsaRengue Annual Dance Bash 2017. His motto for song selection – “Don’t play it if you know you won’t dance to it”.